UPDATED 4/8/18: The Archies #6 is out 4/11. Perfect time to present this one again! Left: Main cover by Greg Smallwood. By the way, this is what I suggested in my list last July: “Blondie. 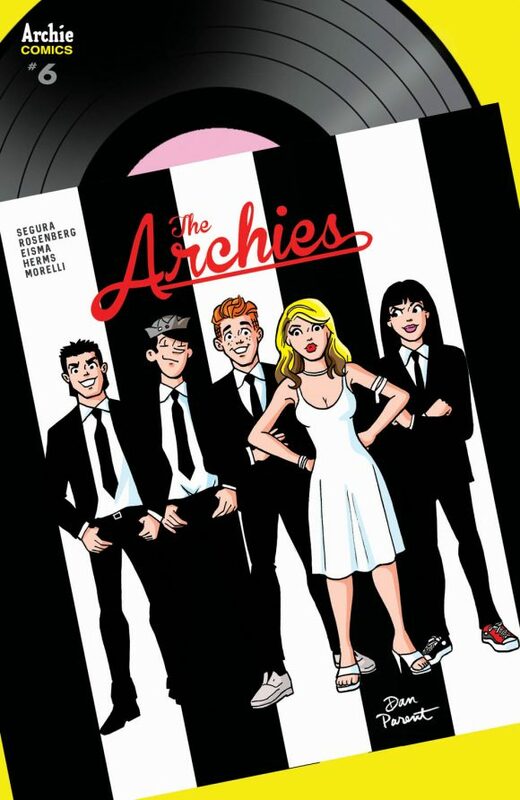 As Archie tries to score an opening gig at CBGB with the ultimate new wave act, Betty and Veronica get style tips at the knee of Debbie Harry.” Hmmm… Right: Variant cover by Matthew Taylor. Now, one of the biggest Monkees fans I know is artist Mike Allred, who did a variant cover for The Archies #4. So I asked him to put together a list of his 13 Favorite Monkees Songs. Enthusiastic dude that he is, he jumped at the chance and you can check out his list by clicking here. But I’m also a big Blondie fan. And, as it happens, so is artist Dan Parent, a modern master of the classic Archie design, who did the variant cover you see above. Dan was also quite willing to put together a Top 13 list, and you’ll find it below. 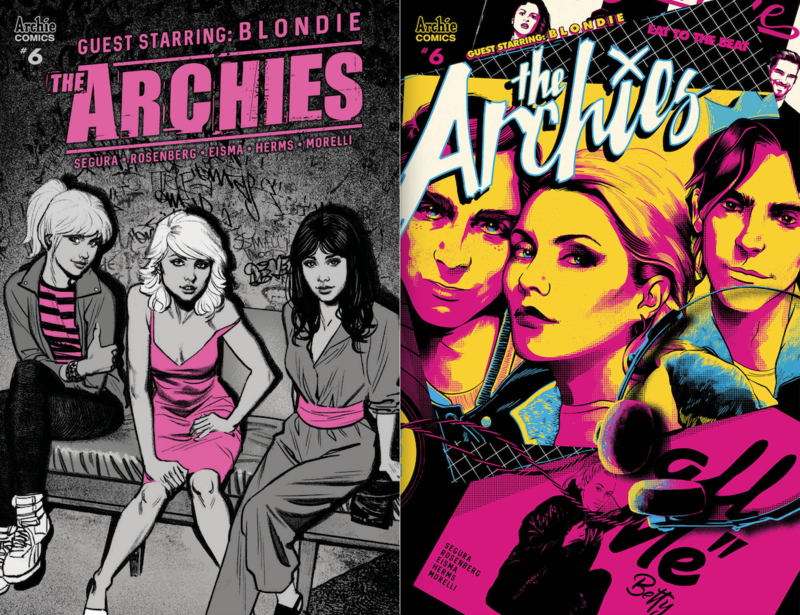 As a lifelong Blondie fan, I was really excited to do a cover for the “The Archies Meet Blondie” book! I’m also excited to pick my 13 favorite Blondie songs for 13th Dimension! Here goes! 13. Maria. This was Blondie’s comeback song in 1999 after a 17-year hiatus. It’s a good hooky pop song and reminded me of some of their earlier work. 12. Union City Blue. One of the nice ballads from Eat to the Beat, which I feel is their best album. Her voice is so sweet on this song. 11. X Offender. From Blondie’s first album, which is so great in its sound, borrowing a lot from girl groups of the ’60s, and a blend of punk rock. This album was a pure rock album (along with Plastic Letters) before they starting mixing different styles. This song really represents that early sound. 10. Rapture. Probably their most ground-breaking song, bringing rap to the mainstream airwaves. It was not one of my favorites early on, but it holds up really well throughout the years. A good example of Blondie’s experimentation with their style. 9. Atomic. Not a huge hit, but a really cool punkish/disco song. Another song that really holds up well. 8. Hanging on the Telephone. Not an original Blondie song; it’s a cover of a song by the Nerves. But it’s a really good rock song. 7. Slow Motion. Not a single, but a really sweet sounding song. It’s like a 1960s girl group tune that could have been produced by Phil Spector. 6. (I’m Always Touched) by Your Presence Dear. Yet another sweet, mellow song that has a 1960s sound to it. It has weird, trippy lyrics, and at the same time it’s a love song! 5. Call Me. This was their biggest hit, and it really represents the sound of the times. It’s a little post-disco, a lot new wave and really more of a Debbie Harry song than Blondie, since it’s really a team-up of Debbie Harry and Giorgio Moroder. 3. Heart of Glass. The famous disco song. Meant as a parody of disco, it became a disco hit. And put Blondie in the mainstream. But it’s a lot more than that, lots of layers to it, really good singing, and easily one of the most re-listenable songs of theirs! 2. Sunday Girl. Another one from their breakout Parallel Lines album, this is pretty much the perfect pop song. It’s sugary sweet, with a terrific guitar riff and is a great song of the new wave era. 1. Dreaming. My favorite Blondie song, maybe my favorite song ever! (Although that changes a lot!) The perfect song: part pop, part punk, an insane drum beat that never lets up, and a great, simple message about the beauty and simplicity of dreams! Her voice is at its best, and I think this was the high point of their career. I remember hearing it on Saturday Night Live (as a 13-year-old ) and being shaken by its sound! So there you have it! As with most lists, everybody has their opinions, and suggestions for what was NOT on the list! While The Tide is High and One Way or Another are fine songs, I don’t think they’re the cream of the Blondie crop! Thanks for letting me take part in this fun assignment! I’d put “Atomic” higher, but this is a great list! Yup, it was also a number one single, so definitely one of their biggest hits ever! Agree with Wendy. Atomic was a much loved number 1 hit in the UK though not in the US (It is probably my favourite). Long Time from the Pollinator album is also worthy of inclusion. It has not dented the charts. (It made No1 vinyl chart single in the UK as was Fun, if that counts?!) but 1M+ YouTube hits. Great taste here – Not sure why but Dreaming is often overlooked in top Blondie track lists despite being an amazing, timeless track and a UK No2 hit. You nailed it, Dan. “Dreaming” absolutely tops the list. I would have substituted “One way…” for “Slow Motion,” but that’s about it. I was nicely surprised to see your list looks a lot like mine probably would. Definitely not what most people would pick. I would replace Rapture and Sunday Girl with Pretty Baby and In the Sun. Or T Birds or Angel on the Balcony. But otherwise you picked all the right ones, especially from Eat to the Beat, all of which would be on my list also. I would have loved to see Picture This in the line up. Love your list. Always a fan of Slow Motion- great to see it recognised.My fav is Atomic and Union City Blues.In the Flesh was a huge hit in Australia.